An Award as a gift ! Wow, Sew Fashionably Modest has nominated me for a blog award. 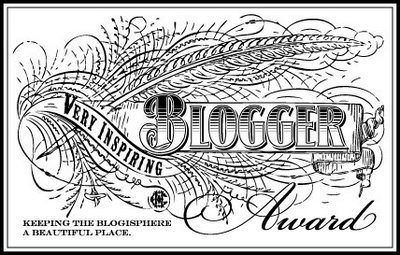 I’ve never has a blogging award before, and I’m delighted. What a lovely seasonal gift ! This award doesn’t come with a black-tie dinner and a trophy. It comes with some attractive icons, links to a large circle of lovely sewing people, and a few responsibilities. Here are the choices. I choose the inspiring one (early 20c is a favourite period for style), and have added it to my right hand menu. I live in a tiny house bursting with books, sewing machines, musical instruments, in a garden where I’ve planted many trees (including a Victoria plum :D). I have learned to play piano, oboe, viola (none of them well, but I loved it – a true amateur). I have absolutely no talent for team or ball sports, but I did represent my university at sailing. I used to be an academic, and love doing research. I was so young when I learned to sew and knit that I can’t remember it. In the days before television, my mother and I sat by the fire hand sewing in the evenings. Communing with fabric – by Shams. Details about process, and interesting re-design ideas. Diary of a sewing fanatic – by Carolyn. Carolyn is a particular hero – I aspire to do what she does, working from her basic blocks to make her own patterns. Though I wouldn’t do it with dresses ! Did you make that – an entertaining blogger from London. I’m honoured to be in the ‘Wardrobe Inspiration’ section of Robin’s A little sewing. I’d nominate her, but Robin has already received this award. 5. Include the rules – if you’ve read this far, you know them ! 6. Inform your nominees by posting a comment on their blogs – yes done that with pleasure. Best Wishes and Seasons Greetings to you. I hope you have lots of lovely gifts too. This entry was posted on December 22, 2012 at 9:22 am and is filed under sundry messages. You can subscribe via RSS 2.0 feed to this post's comments. Both comments and pings are currently closed.